mainly, with a few years spent in Indonesia, facts that aren’t exactly hard to dig up.) 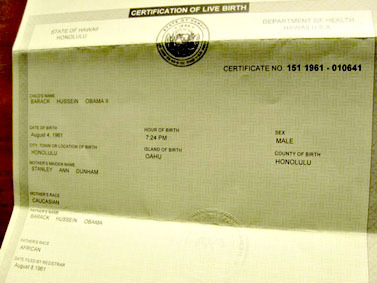 Still, Huckabee’s not a birther. He thinks Obama was born in America. The only reason I’m not as confident that there’s something about the birth certificate, Steve, is because I know the Clintons. I’m convinced if there was anything that they could have found on that, they would have found it, and I promise they would have used it. That’s brilliant! Huckabee wants to appear sane, so he can’t be a birther. But he probably doesn’t want to lose the birther vote either, since a big part of his base believes the birther conspiracy. So how does he explain not believing it? By pointing to Obama’s certificate of live birth? By mentioning the birth notices in the Honolulu papers in 1961? By quoting the director of the Hawaii State Department of Health? Nope. He shows the nutballs that he’s one of them by appealing to their even more rock solid belief in the supernaturally malevolent powers of the Clintons. Because that’s a genuinely tough call: should you believe that Obama was born in Kenya, or should you believe that Hillary and her gang of Arkansas thugs aren’t quite as demonically ruthless as you thought? Decisions, decisions. Either way, though, bravo to Huckabee for inventing such a terrific dodge.